No greater example (until now) exemplified this possibility than the recent “Into the Storm,” one of the most incoherent films I’ve ever seen. But its trajectory was set, admittedly, by the gradual erosion of genre standards that began with the volatile “Armageddon,” where not a single shot lasted longer than three seconds. In its wake came “The Day After Tomorrow,” also dimwitted, and then “2012,” “San Andreas” and “Pompeii,” each less inspiring than the last. And now we have “Geostorm,” a movie so bankrupt of ideas that it has the gall to masquerade as something more meaningful: an action picture where disaster scenarios become a consequence of shrewd political gains. While there is no doubt that a lack of preparation in climate change has added to the growing problem of hazardous weather patterns, here is a movie that provides, unintentionally, an argument that everyone involved may just be getting exactly what they deserve. The prologue paints a substantially grim portrait. Heedless of the warnings from scientists growing alarmed by the rapid changes occurring to the planet, the world’s populations begin experiencing natural disasters with increasing severity (a newscast montage shows images of unspeakable destruction and casualties). Fearing the worst, ambitious minds have funded new technologies as a way of protecting the Earth from more harm, leading to the creation of a satellite facility orbiting Earth known as the “Dutch Boy,” which protects the atmosphere from, I guess, harmful solar energies that could aggravate the already-volatile weather patterns. This collaborative effort is lead enthusiastically by Jake Lawson (Gerard Butler), a rebellious scientist who fits the summer blockbuster demand of being smart, sarcastic and incredibly attractive; one gathers while watching him exchange barbs in front of a panel of government officials that if he is ineffectual at staving off their takeover of his mission, he could very well find a secondary career as a comedian or an underwear model. Alas, the screenplay by Dean Devlin and Paul Guyot instead relegates him to being a recluse in one of those cheap-looking aluminum trailers on the edge of the coast, where he is visited one day by his brother Max (Jim Sturgess), the new director of the Dutch Boy mission, who is fearful that something destructive is at work aboard the satellite station: a worker has been killed in what may not necessarily be a mere accident, and fears that the system Jake has designed may have either been damaged or exploited. A rivalry between the brothers is established in the earlier scenes (Max agrees that his brother should no longer oversee the station), and that in turn leads us through the conventional exchange of pseudo-macho insults before Jake agrees to return to the site of his creation. This also conflicts with the wishes of his young daughter, who fears for his life, but is assured that he will return unharmed. Many of these details exist not to paint a thorough portrait of a family dynamic, however; they are staples of a foreshadowing device where we must believe, however superficially, that the main star must survive all obstacles to reunite with his relatives, otherwise all the arguments and unresolved feelings have been wasted as a display in front of the camera. For a good while the momentum seems to contradict those possibilities. Jake returns to the Dutch Boy to find that the death of a crew member may have, in fact, not been a mere accident; hidden files contained in the computer mainframe have kept a precise record of activities that indicate influence from elsewhere. This discover is made just as an outside authority disables one of the satellites, and a disaster involving extreme temperatures strikes Hong Kong; perhaps not coincidentally, a college friend and informant to Max is there just as the heat overtakes the city. Is the motivation political? Of course. But the movie clouds the issue of what it desires by simply using the ambitious special effects to set up the intrigue; they are not the centerpieces of a disaster film, but the footnotes of a story that suspects a government agent may be trying to sway political action against those who control the Dutch Boy. Something interesting might have been done with this premise. As a departure from the typical convention of a film about destructive natural forces, the movie indicates a desire to offer intriguing contexts. Yet as I watched “Geostorm” move through all the derivative movements of political intrigue, suspicious character motives, inane dialogue and over-simplified scientific explanations, I no more cared about the sources of these conflicts than I did about the austerity of the visuals. Here is a movie where the title alone promises far more than it is willing to deliver – the actual disasters themselves are a brief notation in a script that otherwise functions as a shallow move through the corruptions of government officials. And by the time we get to the all-important reveal just as the satellites collectively must be taken offline and rebooted, the source of the agenda is implausible. Are we really expected to believe that something this high up, with this amount of influence, is willing to sabotage the world powers just so that he could be placed in a position of authority over the Dutch Boy’s functions? Is he naïve enough to think he can even get away with it, especially after his intentions are discovered? Devlin, a first-time filmmaker with a lengthy career as a producer and writer of action pictures, ought to have known better; after co-piloting several well-known endeavors in this field – including “Independence Day” and “Stargate” – he has a knowledge of blockbusters that is hardly novice. But he conducts this movie as if carried by some impulse of confusion. Clearly he doesn’t want this story to be your run-of-the-mill excursion, nor is he all that interested in emphasizing the human dynamic (or the social nihilism of the scenario). Are his motivations political? Scientific? Anti-establishment? The movie never centers on a specific point. Its visuals are ambitious but brief. The characters are disposable. The intrigue is shallow and shameless. By the end there is nothing remotely hopeful to hold onto, even to salvage some level of redeeming value. 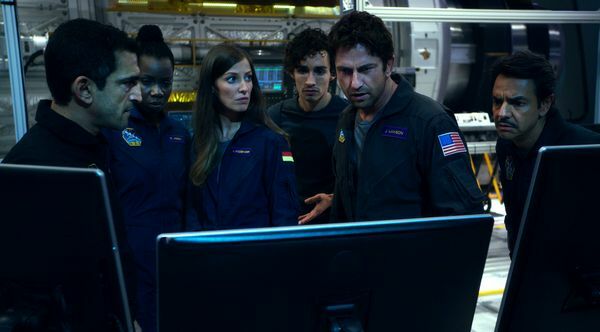 We walk away from “Geostorm” not thankful to have witnessed an attempt at something different, but as nostalgic for some of the more focused disasters of the past. At least something as overkill as “San Andreas” knew where to aim. Here is a movie that was probably made before it ever found a target.